Where do your questions and answers come from? In many cases the answers to our questions are not (yet) addressed in party manifestos, therefore we do not assign any score to that party for that particular question. As soon as we become aware of a new or revised policy we amend the score accordingly. If a party has no official stance towards a topic, we do not assign a score. 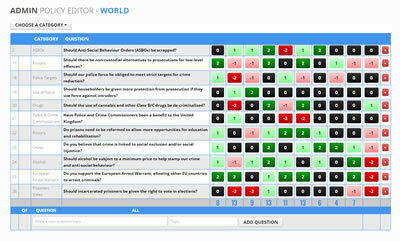 We match questions against answers by maintaining a database of all key policies for all parties we include in our quiz. These policies are sourced from official documentation, manifestos, resources and speeches that the parties have made public. Where possible we make every attempt to keep the original wording, although we may be forced to edit or paraphrase where necessary, although we do not change the meaning. The process of gathering information about party policies is a time-consuming practice, and we may not discover all the policies that parties inevitably change. Obviously, we also cannot guarantee that any policies shown on our site are the latest version, and we can't be held responsible for the omission of policies that are announced. All users are encouraged to check official party websites for the latest updates and publications regarding official policies. Are the questions weighted in any way? We're non-partisan, and don't have any affiliation with any political party, so we make every attempt to ensure that EVERY party has the same opportunity to score the same total score as each other. This obviously is very difficult to achieve. Some parties cover fewer issues than others in their manifestos, or may be 'neutral'. Whilst developing the scoring algorithm, we took considerable time to ensure that where a particular party may lack potential points, they could potentially gain those points in another question or topic area by balancing the type and subject matter of each question. During the run up to the general election we aim to update the scoring mechanism every working day of the week, and where possible over the weekend. We receive email alerts when a manifesto or key policy is published or amended. How are the final scores calculated? As you navigate your way through the quiz each party is assigned a constantly-updated score based on your answers. Once you've finished the quiz we put the scores in order, showing you the most suitable political party that matches your answers. For each question you're given the option to assign 'importance' to that question. By altering the level of importance you can also assign more weight to it if you feel strongly about your answer. For example, if Trident Submarines are a particularly important issue for you, then you can alter the importance when you answer the question. We've attempted to make our quiz as accurate as possible by using official policies that are in the public public domain. We do encourage you to answer as many topics/questions as you can to enable our algorithm to determine which party most matches your answers. So, if you've answered less than 20 or so questions and disagree with the results, you may need to re-take the quiz in order to improve its accuracy. Remember to use the 'Importance' slider on each question, as this adds more weight to a matching party, and will help our system to determine which party is more aligned to your answers. Can I share the results of the quiz? Yes. Once you've completed the quiz you'll be presented with a button that allows you to share your results to Facebook. Each completed quiz is assigned a unique URL (website address), which you can share with others. It's a useful way of comparing your stance with your family members, colleagues and friends. No. We don't collect any personally-identifiable information unless you willingly opt in to receive updates by email (we will never share your email address with anyone). We understand that political bias is a sensitive and often private affair. Is your service really 100% unbiased? Absolutely. Our overall goal is to help voters choose a party that suits their beliefs, no matter what those beliefs may be. We want to encourage as many people to vote at the 2015 general election. From the outset we aimed for 100% unbias whilst the website was in development, and our scoring algorithmsare not designed to sway opinion towards (or against) any party. Why have you included parties from Northern Ireland, Wales & Scotland? Because there is no exclusive 'English' Parliament. Government is represented by MPs from all countries across the UK, and we want to help people from all areas of the UK choose the party that meets their beliefs. As a result, we have decided to include every party that has at least one member of parliament in Westminster that represents a constituency. How do I retrieve a previous quiz? Using the same computer that you last took the quiz on, hover your mouse over 'Quiz' on the main menu. Click on the 'My Quiz' link to take you back to your quiz. Absolutely! You can help us by spreading the word about www.whoshallivotefor.com by letting your friends and family know about it. It's a great way of comparing your stance with others around you. Share it via Twitter, Facebook, email and wherever you can! We'd really appreciate it if you made us aware of any errors that you may have spotted whilst using the site. Please feel free to report any anomolies by emailing us at info@whoshallivotefor.com, or drop us a line by visiting our contact us page. Why have you chosen blue for your colour scheme? We played around with lots of neutral colour schemes (mainly variants and hues of black, white and grey) and decided to introduce a colour that would complement our service. Blue was chosen not as a 'nod' to any particular political party, but as a personal choice of the founder. Why is it slow sometimes? OK, at the moment it isn't particularly show. In fact it's fairly fast. However, if you do notice that our website becomes slow or unresponsive, it may be because we've been featured in a national newspaper or TV programme. Because we don't have the money to finance a huge server the site may suffer at times. Whilst that quality of our content isn't exactly our strongest skill, we hope that it doesn't detract what we're trying to achieve - helping to get more people interested in this general election. Our team consist of just two people, a website developer and a teacher. We don't have any writers onboard that can help us to ensure everything makes sense, because we don't have the resources to pay them, so you'll have to put up with us. Still, we'll try our best to be as clear and consise as possible.